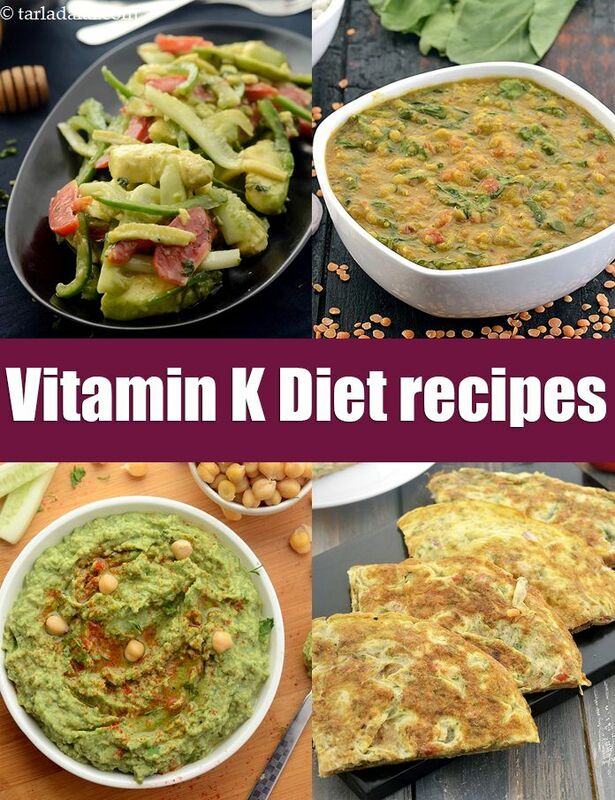 Vitamin K Diet, Vitamin K Recipes, Benefits + Foods Rich in Vitamin K. Vitamin K is a fat soluble vitamin so cook your Vitamin K rich foods in a healthy oil to absorbed. Try our grilled broccoli recipe which is grilled with some olive oil. Vitamin K is a fat soluble vitamin which has a key role in blood clotting and bone metabolism. It is necessary for the formation of prothrombin by the liver. Prothrombin is the normal constituent of the blood which helps in blood clotting on direct contact with air and thus prevent excessive bleeding. Bone metabolism is a continuous process where mature bone tissue is removed from the skeleton and replaced by new tissue. When injuries occur to the bone like fractures or bruises, then Vitamin K kicks in to heal the injury. Vitamin K is a fat soluble Vitamin which means it is absorbed in the body in the presence of fat. So have your Kale with some olive oil or cook your Spinach in oil. Enjoy our kale masoor antioxidant salad recipe which is tossed with olive oil. Vitamin K prevents loss of bone density and preventing the onset of Osteoporosis. Vitamin K is essentially a group of 2 compounds - Vitamin K1 and Vitamin K2. Vitamin K1 is obtained from vegetables, especially the greens while vitamin K2 is obtained from meat, eggs, dairy products like cheese and bacteria synthesized in the gut. Most of this vitamin is derived from these bacteria’s and hence our blood vitamin K levels depend on how healthy our gut is. Try our egg paratha recipe, sunny side up eggs recipe or scrambled egg recipe to to up your Vitamin K.
A deficiency of this vitamin is usually not seen. However, if it persists, doses of vitamin K help in improvising the blood clotting function. USDA recommends 120 mcg/day of vitamin K for adults.